A programming method in the C++ language is presented that allows developers of scientific numerical simulations to better reuse already developed software leading to less time and effort spent on writing code. A software package is also presented which allows simulation developers to more easily take advantage of the introduced programming method in both desktop and supercomputing environments. We provide improved routines to model the ocean carbonate system, i.e., to compute ocean pH and related variables from dissolved inorganic carbon and total alkalinity. These routines (1) rely on the fastest available algorithm to solve the alkalinity-pH equation, which converges even under extreme conditions; (2) avoid common model approximations that lead to errors of 3% or more in computed variables; and (3) account for large pressure effects on subsurface pCO2, unlike other packages. The regional WRF-Chem model was used to study aerosol particles from biomass burning in South America. The modelled estimates of fire plume injection heights were found to be too high, with serious implications for modelled aerosol vertical distribution, transport and impacts on local climate. A modified emission scenario was developed which improved the predicted injection height. Model results were compared and evaluated against in situ measurements from the 2012 SAMBBA flight campaign. This paper presents results from the modularization of the GEOS-Chem chemical transport model, and its coupling as the chemical operator within the NASA-GMAO GEOS-5 Earth system model (ESM). The key findings are that chemistry within the modular GEOS-Chem system shows consistent, high strong-scaling properties across the range of distributed processors, transport is the limiting component prohibiting efficient scalability, and GEOS-Chem is able to generate suitable chemical results in an ESM. We have implemented the TwO-Moment Aerosol Sectional (TOMAS) microphysics model in NASA GISS ModelE2, called “ModelE2-TOMAS”. We compared global budgets of ModelE2-TOMAS to other global aerosol models and evaluated the model with various observations such as aerosol precursor gas, aerosol mass, number concentrations, and aerosol optical depth. We found that ModelE2-TOMAS agrees with observations reasonably and that its predictions are within the range of other global aerosol model predictions. Effective calibration of global models is inhibited by the computational demands of 3-D simulations. As a solution for the NEMO-MEDUSA model, we present an efficient emulator of surface chlorophyll as a function of MEDUSA’s biogeochemical parameters. The emulator comprises an array of site-based 1-D simulators and a quantification of uncertainty in their predictions. It is able to produce robust probabilistic estimates of 3-D model output rapidly for comparison with satellite chlorophyll. The trend in High Performance Computing (HPC) is for less memory bandwidth relative to the computational power of each core. With each CPU having multiple cores, the best way of using HPC systems is not always straightforward. For some time critical applications, shorter run times can be obtained by using only some of the cores per CPU and keeping the others idle. A number of factors are required to consider, but this provides a simple technique for a significant gain in the application speed. 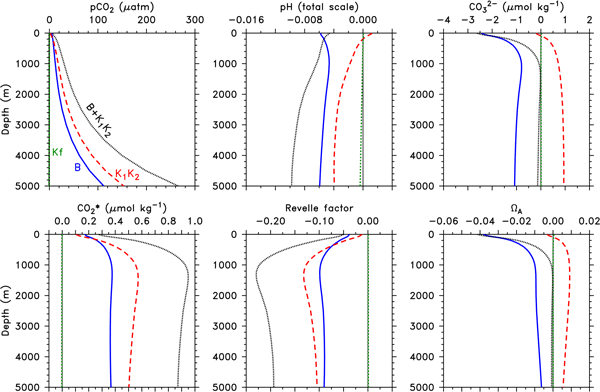 A Global Carbon Assimilation System based on the Ensemble Kalman filter (GCAS-EK) is developed for assimilating atmospheric CO2 data into an ecosystem model to simultaneously estimate the surface carbon fluxes and atmospheric CO2 distribution. This assimilation approach is similar to CarbonTracker, but with several new developments. The results showed that this assimilation approach can effectively reduce the biases and uncertainties of the carbon fluxes simulated by the ecosystem model. In this study we explore the problem in running default CAM5-SCM, which initializes the aerosol to zero, and test three potential fixes in four different cloud regimes: DYCOMSRF02, MPACE-B, RICO, and ARM95. Stratiform cloud cases (DYCOMS RF02 and MPACE-B) were found to have a strong dependence on aerosol concentration, while convective cases (RICO and ARM95) were relatively insensitive to aerosol specification. A new numerical model, EDDA, is developed for simulating debris-flow erosion, deposition, and associated changes in debris mass, properties, and topography. An adaptive time stepping algorithm is adopted to assure both numerical accuracy and computational efficiency. The performance of the model has been verified through four numerical tests and a large-scale case study. EDDA can be a powerful tool for debris-flow risk assessment in a large area and real-time landslide warning. RRAWFLOW is a lumped-parameter model that simulates streamflow, springflow, groundwater level, or solute transport (available for download). For many applications, lumped models simulate the system response with equal accuracy to that of more complex distributed models. Gamma functions are used for estimation of impulse-response functions, and a spline fit to a set of points is introduced as an optional method for this purpose. Several options are included to simulate time-variant systems. The main contributions of this manuscript are •	A novel and easy to use ArcMap tool is proposed for bivariate statistical analysis model implementation. •	The developed tool facilitated and sped up the BSA modelling process of frequency ratio, weights of evidence, and evidential belief function. •	This tool classifies the variables based on the acquired weights automatically. •	All three methods were tested on a study area and landslide susceptibility maps were produced. Atmospheric dry deposition is classically modelled using an average roughness length. This approach cannot account for the spatial variability of dry deposition in urban areas. We extend here the urban canyon concept, previously introduced to parametrise momentum and heat transfer to mass transfer. This approach provides spatially distributed dry deposition fluxes that depend on surfaces (streets, walls, roofs) and flow regimes (recirculation and ventilation) within the urban area. A model that simulates groundwater and surface water flow has been developed for the major river basins of the continental United States. Fundamental data sets provide input to the model resulting in a natural organization of stream networks and groundwater flow that is compared to observations of surface water and groundwater. Model results show relationships between flow and area that are moderated by aridity and represent an important step toward integrated hydrological prediction.